Here are we talk about the most used social media in Russia. Not different with the other countries, the Russian community is also a part of the netizens, in which every activity of the citizen can not be separated from social media. Russia with 146 million citizen is one of the largest market for social media providers in the world, 85 million people are internet users. From the side of internet users, In Russia growth every year, a lot of facility provide by government, there is also a free internet network in various stations, this spur usage and made industry one of the highly developed social media in this country. But the difference is that Twitter, Facebook, YouTube and Instagram dominate as social media in various countries in the world currently, but Russia and the surrounding area (Ukraine and Kazakhstan) tend to use local platform for this. This trend makes local platforms more growth and business matters such as advertising, news, more focused. And to know the most widely used social media in Russia, here are the most used social media in Russia. VKontakte is a friendship site like Facebook. As if we know that Facebook is very popular in the world, but in Russia is different, Russian people are more likely to use VKontakte or commonly abbreviated VK. The basic function of this friendship site similar with Facebook, but there are more advantages on VKontakte, such as friendship site users can work to listen to music, watch videos, streaming online and even function for users to do job search. 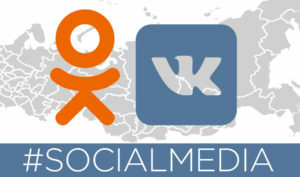 VKontakte or VK friendship site is the number one friendship site in Russia and the most used social media in Russia. On VKontakte there are 410 million register accounts on 2017. In general, users of VKontakte’s Friendship Site spread around the world but the majority are in Russia and Eastern Europe. VKontakte’s friendship site is the subsidiary of the company Mail.Ru Group, Pavel Durov initiated this company. The launching of VKontakte friendship was on 2006, globally is currently the fifth most populous in the world. Now, It is known that the VKontakte or VK friendship site is popular for users aged 18-34, in Russia, the older social media users are more likely to use an OK site, previously named Odnoklassniki or (which means classmate). OK.ru or dnoklassniki is a social networking service that is for users of classmates and old friends. OK.ru build by Albert Popkov slid on March 4, 2006. Until now the OK.ru website is known to have recorded 200 million user accounts. There is an age limit for users to create an account for at least seven years. Basic function site OK.ru one of which where users can create profiles, update status, share pictures, find friends. One of OK.ru’s goals is that users can connect with old friends who lost contacts and friends. YANDEX search engine is the largest search engine in Russia and controls 65% of users in Russia. Globally YANDEX search engine is in position 4 in the world. And known about 150 million searches using YANDEX search engine every day. In Russia, for searches on any information such as exchange rates, weather, movies or other news people use YANDEX search engine. Before, Yandex Company started around in the 80s, when programmer Arkady Volozh started the company under the name CompTek. At the time Arkady Volozh interested in the data processing algorithm. Then create an algorithm that makes it possible to find a large variety of information based on the morphology of the writing language. Arkady Volozh and Ilya Segalovich estrablished YANDEX search engine and the launching was on September 23, 1997 in Moscow. Yandex company provide service as follow, Yandex.mail is an email service from Yandex company introduce on June 26, 2000. As for Yandex.Musik introduced September 22, 2010, that provides legal music service, as well as Yandex.video. Yandex also provides free Yandex.Maps service map service as Google Map, Yandex launched on August 27, 2004. In addition to these services Yandex provide service to allow users to edit the map, the name of service is Yandex.National Card, that was released on April 8, 2010. And there is also a jamming service, Yandex.Probki launched May 30, 2006. YANDEX search engine also prepares indexed pages of web pages, various documents in PDF, RTF, .doc, .xls, RSS, .ppt .swf formats. It also adjusts searches for morphology of English, Russian, Ukrainian, Tatars, Byelorussian, Kazakh, France. YANDEX search engine also allows searching by using a logical algorithm, ie a search on a specific scope or advanced search with exceptions. Today many e-mails come in and out in everyday life. To simplify the management then we tend to use free email portals from famous providers such as yahoo to google. Uniquely people. This site is new because it was born from the hard work of Dmitry Grishin and Yuri Milner in 1999. Listed as the 6th most popular site in Russia. Mail.ru also has a wide range of active users ranging from Kazakhstan to Germany. In its development this site now also began to actively move in the e-commerce sector. Moi Mir platform is the same communication platform as Google + ,. It is part of the extension of mail.ru’s mail platform providers. Mir Mo itself currently there are 16.6 million more people use it per month. User use for various purposes such as sharing music, videos, and pictures, looking for new friends and for games. Above is the most used social media in Russia. but in addition to various social media sites, in Russia there are some social media sites are prohibited. Sites that are prohibited if it contain child pornographic material, extremists, information about drug distribution.